We’re halfway through Easter week. If you’ve taken time to stop and look at this blog I want to encourage you to take time to stop and remember your Savior today too. Don’t let the business of the week cause you to ignore the importance of this week. Take time to savor Christ this week. Take time to taste Him, to look upon Him, to meditate on Him, and after you’ve done all that – take time to praise Him this week. May we get less caught up in bunnies and eggs and more focused on the death and resurrection. Some suggestions of things to do to savor Him this week: watch the Passion, read from the gospel accounts of what took place during this week and look-up where they were prophesied (using the cross references in your bible), use a devotional to help you focus on Jesus and what He did for us (Grady and I are using a devotion that John Piper’s wife, Noel, wrote titled “Lenten Lights” – for some reason I keep calling it lentil lights 🙂 – oh brother! ), play music that focuses on Christ’s death and resurrection, etc. I did this piece of art work years ago. 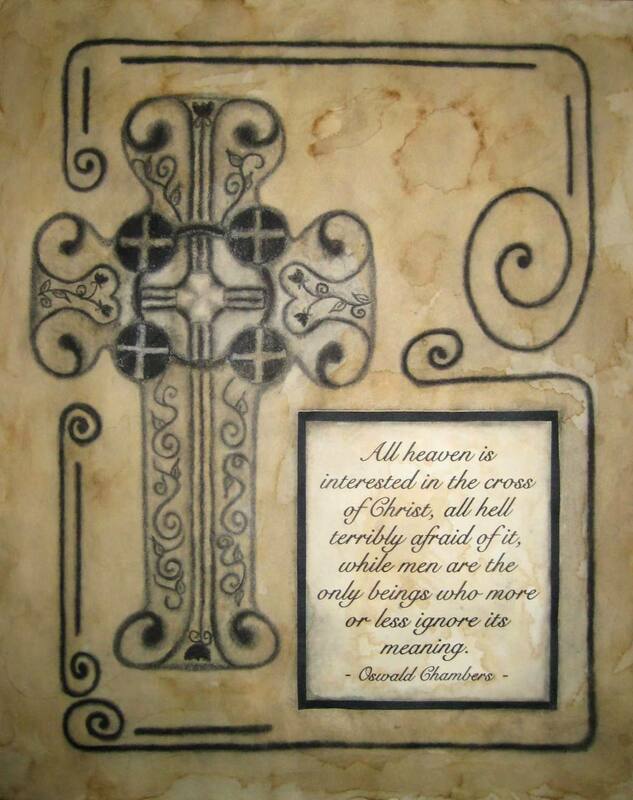 I love this quote by Oswald Chambers and I did a piece like this for Christmas gifts one year. Let’s not ignore the meaning of the cross this week – savor it with me. Thanks for the post. Looking forward to seeing your hubby tomorrow. I was baptized at LHBC last Easter. The past year has been one I cannot forget. A few years ago I bought Passion just becasue of the hype over the movie. I tried (years ago) watching it and I will be very honest, it was very confusing. Why is he sweating? What is He doing in the dark? Why did that man run? Who is the woman in the crowd? A wife? A girldriend? Why doesn’t He defend Himself? So I turned it off. The past year or so I have been able to put all the pieces together studying His word. This Easter was a reminder that we need to share this story with Everyone. We have people in our lives that don’t know it. We just assume they do. I knew he was crucified (wasn’t really sure why) and that 3 days he rose again (thought He rose to Heaven that day). But that’s not the whole story. The WHOLE story needs to be told. The WHOLE story is Life Changing. Thank you for using your talents and gifts for our Lord. Your art work is beautiful and thoughtful. I’m glad you rediscovered this love for painting, and are using it to reflect God’s Word. Blessings. Thank you for taking a look Brother Gerry!